The Kingdom of Hawaii was established in 1795 with the subjugation of the smaller independent chiefdoms of Oʻahu, Maui, Molokaʻi, and Lānaʻi into one government. In 1810 the whole of the islands were finally unified when Kauaʻi and Niʻihau joined the kingdom willingly and without bloodshed or war. The Kingdom was overthrown in January 17, 1893 and the Republic of Hawaii was established, eventually to become the U.S. state of Hawaii. A series of battles, lasting 15 years, was led by the warrior chief who would become Kamehameha the Great. The Kingdom of Hawaii was established with the help of western weapons and advisors, such as John Young and Isaac Davis. Although successful in attacking both Oʻahu and Maui, he failed to secure a victory in Kauaʻi, his effort hampered by a storm and a plague that decimated his army. Eventually, Kauaʻi's chief swore allegiance to Kamehameha. The unification ended the ancient Hawaiian society, transforming it into an independent constitutional monarchy crafted in the traditions and manner of European monarchs. The Hawaiian army and navy developed from the warriors of Kona under Kamehameha I, who unified Hawaii in 1810. The army and navy used both traditional canoes and uniforms including helmets made of natural materials and loincloths (called the Malo) as well as western technology like artillery cannons, muskets, and European ships . European advisors were captured, treated well and became Hawaiian citizens. 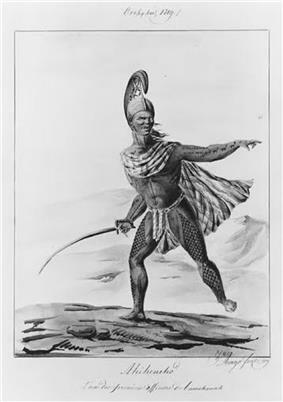 When Kamehameha died in 1819 he left his son Liholiho a large arsenal with tens of thousands of men and many warships. This helped put down the revolt at Kuamoʻo later in 1819 and Humehume's rebellion on Kauai in 1824. During the Kamehameha Dynasty the population in Hawaii was ravaged by epidemics following the arrival of outsiders. The military shrank with the population, so by the end of the Dynasty there was no Hawaiian navy and only an army, consisting of several hundred troops. After a French invasion that sacked Honolulu in 1849 Kamehameha III sought treaties with the United States and Britain to become a protectorate state. During the outbreak of the Crimean War, in Europe, Kamehameha III declared Hawaii a neutral state. After Hawaii became a protectorate of the United States strong pressure was put on Kamehameha IV to make trade exclusively to the United States even annexing the islands. To counterbalance this situation Kamehameha IV and Kamehameha V pushed for alliances with other foreign powers, especially Great Britain. Hawaii claimed uninhabited islands in the Pacific including the Northwestern Hawaiian Islands, many of which came into conflict with American claims. Following the Kamehameha Dynasty the royal guards were disbanded under Lunalilo after a barracks revolt in September 1873 until his death leaving Hawaii solely protected by the United States who had wavering support of the monarchy. 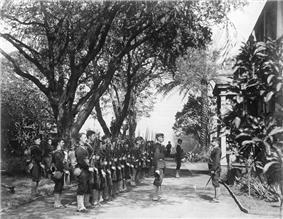 The small army was restored under King Kalakaua but failed to stop the 1887 Rebellion by the Missionary Party. In 1891 Queen Liliʻuokalani came to power. Following the elections 1892 with petitions and request from her administration to change the constitution of 1887. The US protectorate policy was that at least one U.S. cruiser must be present in Hawaii at all times. So, on January 17, 1893, Liliʻuokalani, believing the U.S. military would intervene if she changed the constitution, waited for the USS Boston to leave port. Once it was known that Liliʻuokalani was revising the constitution, the Boston was recalled and assisted the Missionary Party in her overthrow. In 1993, the U.S. Congress passed the Apology Resolution, admitting wrongdoing and issuing an apology. Following the overthrow and the establishment of the Provisional Government of Hawaii the Kingdom's military was disarmed and disbanded. From 1810 to 1893, the Kingdom of Hawaiʻi was ruled by two major dynastic families: the House of Kamehameha and the Kalākaua Dynasty. Five members of the Kamehameha family led the government as king. Liholiho (Kamehameha II) and Kauikeaouli (Kamehameha III), were direct sons of Kamehameha the Great. For a period of Liholiho and Kauikeaouli's reigns, the primary wife of Kamehameha the Great, Queen Kaʻahumanu, ruled as Queen Regent and Kuhina Nui, or Prime Minister. Under the rule of Queen Kaʻahumanu, the powerful newly converted Protestant widow of Kamehameha the Great, Catholicism was illegal in Hawaii, and in 1831 chiefs loyal to her forcibly deported French Catholic priests. Native Hawaiian converts to Catholicism claimed to have been imprisoned, beaten and tortured after the expulsion of the priests. The prejudice against the French Catholic missionaries remained the same under the reign of her successor, the Kuhina Nui Kaʻahumanu II. The Roman Catholic Diocese of Honolulu returned unpersecuted and as reparation Kamehameha III donated land for them to build a church upon. "Where are you, chiefs, people, and commons from my ancestors, and people from foreign lands? Hear ye! I make known to you that I am in perplexity by reason of difficulties into which I have been brought without cause, therefore I have given away the life of our land. Hear ye! but my rule over you, my people, and your privileges will continue, for I have hope that the life of the land will be restored when my conduct is justified. Done at Honolulu, Oahu, this 25th day of February, 1843. Dr. Gerrit P. Judd, a missionary who had become the Minister of Finance for the Kingdom, secretly arranged for J.F.B. Marshall to be envoy to the United States, France and Britain, to protest Paulet's actions. Marshall, a commercial agent of Ladd & Co., conveyed the Kingdom's complaint to the Vice Consul of Britain in Tepec. Rear Admiral Richard Darton Thomas, Paulet's commanding officer, arrived at Honolulu harbor on July 26, 1843 on HMS Dublin from Valparaíso, Chile. Admiral Thomas apologized to Kamehameha III for Paulet's actions, and restored Hawaiian sovereignty on July 31, 1843. In his restoration speech, Kamehameha III declared that "Ua Mau ke Ea o ka ʻĀina i ka Pono" (The life of the land is perpetuated in righteousness), the motto of the future State of Hawaii. In August 1849, French admiral Louis Tromelin arrived in Honolulu Harbor with the La Poursuivante and Gassendi. De Tromelin made ten demands to King Kamehameha III on August 22, mainly demanding that full religious rights be given to Catholics, (a decade earlier, during the French Incident the ban on Catholicism had been lifted, but Catholics still enjoyed only partial religious rights). On August 25 the demands had not been met. After a second warning was made to the civilians, French troops overwhelmed the skeleton force and captured Honolulu Fort, spiked the coastal guns and destroyed all other weapons they found (mainly muskets and ammunition). They raided government buildings and general property in Honolulu, causing damage that amounted to $100,000. After the raids the invasion force withdrew to the fort. De Tromelin eventually recalled his men and left Hawaii on September 5. Anticipating this foreign encroachment on Hawaiian territory, King Kamehameha III had dispatched a delegation to the United States and Europe to secure the recognition of Hawaiian Independence. Lord Aberdeen on behalf of Queen Victoria, assured the Hawaiian delegation that, "Her Majesty's Government was willing and had determined to recognize the independence of the Sandwich Islands under their present sovereign." Her Majesty the Queen of the United Kingdom of Great Britain and Ireland, and His Majesty the King of the French, taking into consideration the existence in the Sandwich Islands (Hawaiian Islands) of a government capable of providing for the regularity of its relations with foreign nations, have thought it right to engage, reciprocally, to consider the Sandwich Islands as an Independent State, and never to take possession, neither directly or under the title of Protectorate, or under any other form, of any part of the territory of which they are composed. The undersigned, Her Majesty's Principal Secretary of State of Foreign Affairs, and the Ambassador Extraordinary of His Majesty the King of the French, at the Court of London, being furnished with the necessary powers, hereby declare, in consequence, that their said Majesties take reciprocally that engagement. In witness whereof the undersigned have signed the present declaration, and have affixed thereto the seal of their arms. Done in duplicate at London, the 28th day of November, in the year of our Lord, 1843. Hawaiʻi was thus the first non-European indigenous state to be admitted into the Family of Nations. The United States declined to join with France and the United Kingdom in this statement. Even though President John Tyler had verbally recognized Hawaiian Independence, it was not until 1849 that the United States formally recognized Hawaii as a fellow nation. November 28 became a national holiday to celebrate the recognition of Hawaii's independence. The Hawaiian Kingdom entered into treaties with most major nations and established over ninety legations and consulates. Dynastic rule by the Kamehameha family ended in 1872 with the death of Kamehameha V. Upon his deathbed, he summoned High Chiefess Bernice Pauahi Bishop to declare his intentions of making her heir to the throne. Bernice refused the crown and Kamehameha V died without naming an heir. The refusal of Bishop to take the crown forced the legislature of the Kingdom to elect a new monarch. From 1872 to 1873, several relatives of the Kamehameha line were nominated. In a ceremonial popular vote and a unanimous legislative vote, William C. Lunalilo, grandnephew of Kamehameha I, became Hawaiiʻis first of two elected monarchs, but only reigned from 1873–1874 due to his early death. 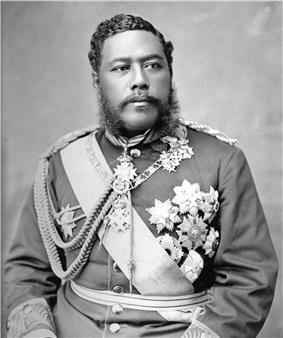 Like his predecessor, Lunalilo failed to name an heir to the throne. Once again, the legislature of the Kingdom of Hawaii needed an election to fill the royal vacancy. Queen Emma, widow of Kamehameha IV, was nominated along with David Kalākaua. The 1874 election was a nasty political campaign in which both candidates resorted to mudslinging and innuendo. David Kalākaua became the second elected King of Hawaii but without the ceremonial popular vote of Lunalilo. The choice of the legislature was controversial, and U.S. and British troops were called upon to suppress rioting by Queen Emma's supporters, the Emmaites. Hoping to avoid uncertainty in the monarchy's future, Kalākaua proclaimed several heirs to the throne to define a line of succession. His sister Liliʻuokalani would succeed the throne upon Kalākaua's death, with Princess Victoria Kaʻiulani to follow. If she could not produce an heir by birth, Prince David Lamea Kawananakoa then Prince Jonah Kūhiō Kalanianaʻole would rule after her. In 1887, a constitution was drafted by Lorrin A. Thurston, Minister of Interior under King Kalākaua. The constitution was proclaimed by the king after a meeting of 3,000 residents including an armed militia demanded he sign it or be deposed. The document created a constitutional monarchy like the United Kingdom's, stripping the King of most of his personal authority, empowering the legislature and establishing cabinet government. It has since become widely known as the "Bayonet Constitution" because of the threat of force used to gain Kalākaua's cooperation. The 1887 constitution empowered the citizenry to elect members of the House of Nobles (who had previously been appointed by the King). It increased the value of property a citizen must own to be eligible to vote above the previous Constitution of 1864 and denied voting rights to Asians who comprised a large proportion of the population. (A few Japanese and some Chinese had previously become naturalized and now lost voting rights they had previously enjoyed.) This guaranteed a voting monopoly to wealthy native Hawaiians and Europeans. The Bayonet Constitution continued allowing the monarch to appoint cabinet ministers, but stripped him of the power to dismiss them without approval from the Legislature. In 1891, Kalākaua died and his sister Liliʻuokalani assumed the throne. She came to power during an economic crisis precipitated in part by the McKinley Tariff. By rescinding the Reciprocity Treaty of 1875, the new tariff eliminated the previous advantage Hawaiian exporters enjoyed in trade to U.S. markets. Many Hawaiian businesses and citizens were feeling the pressures of the loss of revenue, so Liliʻuokalani proposed a lottery and opium licensing to bring in additional revenue for the government. Her ministers and closest friends tried to dissuade her from pursuing the bills, and these controversial proposals were used against her in the looming constitutional crisis. Liliʻuokalani wanted to restore power to the monarch by abrogating the 1887 Constitution. The queen launched a campaign resulting in a petition to proclaim a new Constitution. Many citizens and residents who in 1887 had forced Kalākaua to sign the "Bayonet Constitution" became alarmed when three of her recently appointed cabinet members informed them that the queen was planning to unilaterally proclaim her new Constitution. Some cabinet ministers were reported to have feared for their safety after upsetting the queen by not supporting her plans. In 1893, local businessmen and politicians, composed of six non-native Hawaiian Kingdom subjects, five American nationals, one British national, and one German national, all who were living and doing business in Hawaii, overthrew the queen, her cabinet and her marshal, and took over the government of the Kingdom of Hawaiʻi. USS Boston's landing force on duty at the Arlington Hotel, Honolulu, at the time of the overthrow, January 1893. Historians suggest that businessmen were in favor of overthrow and annexation to the U.S. in order to benefit from more favorable trade conditions with its main export market. The McKinley Tariff of 1890 eliminated the previously highly favorable trade terms for Hawaii's sugar exports, a main component of the economy. In response to Liliʻuokalani's move, a group of European and American residents formed a "Committee of Safety" on January 14, 1893 in opposition to the Queen and her plans. 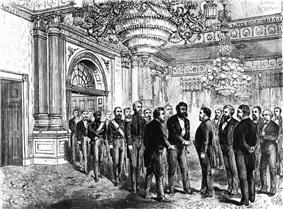 After a mass meeting of supporters, the Committee committed itself to the removal of the Queen, and seeking annexation to the United States. On July 17, 1893, Sanford B. Dole and his committee took control of the government and declared itself the Provisional Government of Hawaii "to rule until annexation by the United States" and lobbied the United States for it. :90 Dole was president of both governments. During this time, members of the former government lobbied in Washington for the United States to restore the Hawaiian Kingdom. President Grover Cleveland considered the overthrow to have been an illegal act of war; he refused to consider annexation of the islands and initially worked to restore the queen to her throne. Between December 14, 1893 and January 11, 1894 a standoff occurred between the United States, Japan, and the United Kingdom against the Provisional Government to pressure them into returning the Queen known as the Black Week. This incident drove home the message that president Cleveland wanted Queen Liliʻuokalani's return to power, so on July 4, 1894 the Republic of Hawaiʻi was proclaimed to wait for President Cleveland's second term to finish. Also in 1894, as lobbying continued in Washington, the exiled government was secretly amassing an army of 600 strong led by former Captain of the Guard Samuel Nowlein. In 1895 they attempted a counter-rebellion, and Liliʻuokalani was arrested when a weapons cache was found on the palace grounds. She was tried by a military tribunal of the Republic, convicted of treason, and placed under permanent house arrest in her own home. On January 24, 1895 while under house arrest Liliʻuokalani wrote a five page declaration in which she dissolved the exiled government and formally abdicated the throne to become a citizen of the Republic in order to avoid future acts of violence designed to restore the monarchy. Following this act, the Kingdom of Hawaii was no more. It was not until a change in administrations to President William McKinley that the Republic of Hawaiʻi succeeded in its goal when in 1898, Congress approved a joint resolution of annexation creating the U.S. Territory of Hawaiʻi. This ostensibly followed the precedent of Texas, which was also purportedly annexed by a joint resolution of Congress after failure to obtain a treaty of annexation. However, the Republic of Texas was not recognized by Mexico, making it disputed territory. Subsequently, the Treaty of Guadalupe Hidalgo superseded the purported annexation of Texas by joint resolution. Therefore, unlike Hawaiʻi, Texas was ultimately annexed by a treaty. Dole was appointed to be the first governor of the Territory of Hawaiʻi. 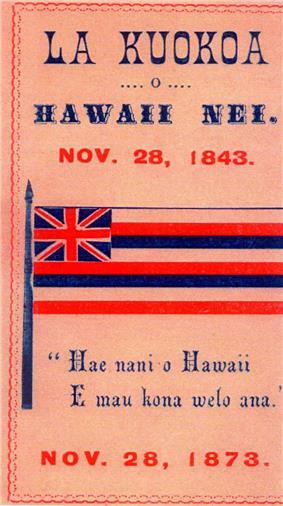 The overthrow of the Kingdom of Hawaiʻi and the subsequent annexation of Hawaiʻi has recently been cited as the first major instance of American imperialism. The Kingdom came about in 1795 in the aftermath of the Battle of Nuuanu, with the conquest of Maui, Molokai and Oahu. It should be noted that Kamehameha I had conquered Maui and Molokai five years prior in the Battle of Kepaniwai, but they were abandoned when Kamehameha's Big Island possession were under threat and later reconquered by the aged King Kahekili II of Maui. His domain comprised six of the major islands of the Hawaiian chain and with Kaumualii's peaceful surrender, Kauai and Niihau were added to his territories. Kamehameha II assumed de facto control of Kauai and Niihau when he kidnapped Kaumualii, ending his vassal rule over the islands. In 1822, Queen Kaʻahumanu and her husband King Kaumualiʻi traveled with Captain William Sumner to find Nihoa, as her generation had only known the island through songs and myths. Later, King Kamehameha IV sailed there to officially annex the island. Kamehameha IV and Kalākaua would later add islands including Pearl and Hermes Atoll, Necker Island, Laysan, Lisianski Island, Jarvis Island, Johnston Atoll, Palmyra Atoll, Samarong?? ?, Ocean (Kure) Atoll, Midway Atoll, French Frigate Shoals, Maro Reef and Gardner Pinnacles. The Stewart Islands or Sikaiana were ceded to Hawaii in 1856 by its residents, but it was never formalized by the Hawaiian government. 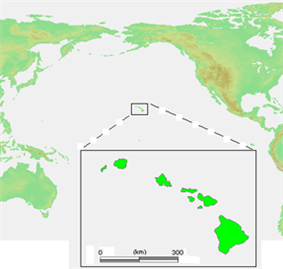 Early in its history, the Kingdom of Hawaiʻi was governed from several locations including coastal towns on the islands of Hawaiʻi and Maui (Lāhainā). It wasn't until the reign of Kamehameha III that a capital was established in Honolulu on the Island of Oʻahu. 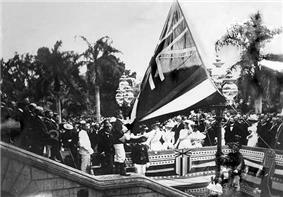 On August 12, 1898, the flag of the Kingdom of Hawaiʻi over ʻIolani Palace was lowered to raise the United States flag to signify annexation. By the time Kamehameha V was king, he saw the need to build a royal palace fitting of the Kingdom of Hawaiʻi's new found prosperity and standing with the royals of other nations. He commissioned the building of the palace at Aliʻiōlani Hale. He died before it was completed. Today, the palace houses the Supreme Court of the State of Hawaiʻi. David Kalākaua shared the dream of Kamehameha V to build a palace, and eagerly desired the trappings of European royalty. He commissioned the construction of ʻIolani Palace. In later years, the palace would become his sister's makeshift prison under guard by the forces of the Republic of Hawaii, the site of the official raising of the U.S. flag during annexation, and then territorial governor's and legislature's offices. It is now a museum. 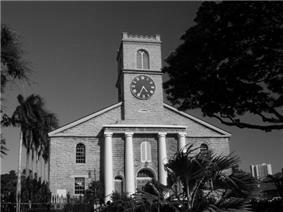 Kawaiahaʻo Church is known as the Westminster Abbey of Hawaiʻi, the site of coronations, royal christenings and funerals. ^ Lawrence, Mary S. (1912). Old Time Hawiians and Their Works. Gin and Company. p. 127. ^ "Hawaiian Territory". Hawaiian Kingdom. Retrieved 2013-10-05. ^ James F. B. Marshall (1883). "An unpublished chapter of Hawaiian History". Harper's magazine 67. pp. 511–520. ^ a: Events Leading to Independence Day, November 28, 1843"ʻokoʻ"Lā Kū. The Polynesian XXI (3). November 200. Retrieved 2010-02-22. ^ a b David Keanu Sai (November 28, 2006). "Hawaiian Independence Day". Hawaiian Kingdom Independence web site. Retrieved 2010-02-22. ^ Hawaii's Story by Hawaii's Queen, Appendix A "The three ministers left Mr. Parker to try to dissuade me from my purpose; and in the meantime they all (Peterson, Cornwell, and Colburn) went to the government building to inform Thurston and his part of the stand I took." ^ Morgan Report, p804-805 "Every one knows how quickly Colburn and Peterson, when they could escape from the palace, called for help from Thurston and others, and how afraid Colburn was to go back to the palace." ^ Kinzer, Stephen. (2006). Overthrow: America's Century of Regime Change from Hawaii to Iraq. ^ La Croix, Sumner and Christopher Grandy. (March 1997). "The Political Instability of Reciprocal Trade and the Overthrow of the Hawaiian Kingdom" in The Journal of Economic History 57:161–189. ^ a b Russ, William Adam (1992) . The Hawaiian Revolution (1893–94). Susquehanna University Press. ^ Tava 1998, pp. 102–103. Christopher Buyers. "The Kamehameha Dynasty Genealogy". Royal Ark web site. Retrieved 2010-02-16. Henry Soszynski. "Index to Kingdom of Hawaii Genealogy". web page on "Rootsweb". Retrieved 2010-02-16.